Though it is the fastest growing religion in the world, Islam remains shrouded by ignorance and fear. What is the essence of this ancient faith? Is it a religion of peace or war? How does Allah differ from the God of Jews and Christians? Can an Islamic state be founded on democratic values such as pluralism and human rights? A writer and scholar of comparative religions, Reza Aslan has earned international acclaim for the passion and clarity he has brought to these questions. In No god but God, challenging the “clash of civilizations” mentality that has distorted our view of Islam, Aslan explains this critical faith in all its complexity, beauty, and compassion. Contrary to popular perception in the West, Islam is a religion firmly rooted in the prophetic traditions of the Jewish and Christian scriptures. Aslan begins with a vivid account of the social and religious milieu in which the Prophet Muhammad lilved. The revelations that Muhammad received in Mecca and Medina, which were recorded in the Quran, became the foundation for a radically more egalitarian community, the likes of which had never been seen before. Soon after his death, the Prophet’s successors set about the overwhelming task of defining and interpreting Muhammad’s message for future generations. Their efforts led to the development of a comprehensive code of conduct that was expected to regulate every aspect of the believer’s life. But this attempt only widened the chasm between orthodox Islam and its two major sects, Shiism and Sufism, both of which Aslan discusses in rich detail. 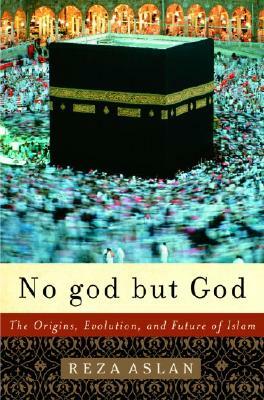 Finally, No god but God examines how, in the shadow of European colonialism, Muslims developed conflicting strategies to reconcile traditional Islamic values with the social and political realities of the modern world. With the emergence of the Islamic state in the twentieth century, this contest over the future of Islam has become a passionate, sometimes violent battle between those who seek to enforce a rigid and archaic legal code and those who struggle to harmonize the teachings of the Prophet with contemporary ideals of democracy and human rights. According to Reza Aslan, we are now living in the era of “the Islamic Reformation.” No god but God is a persuasive and elegantly written account of the roots of this reformation and the future of Islamic faith.